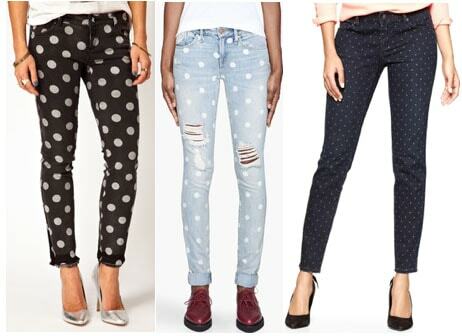 If you’ve been rocking the printed jeans trend, you might want to give polka dot jeans a try. Whether your style is girly, preppy or retro, this cute trend can add a whole new level to your look. Who knows, this fresh take on a wardrobe classic might just become your new style staple! This week, I’ll be showing you how to style a pair of high-waisted polka dot print jeans for both a day of classes and a night out. If you’ve been dying to try out this trend or just want a few new styling tips, read on! Add a modern twist to your retro-inspired jeans by pairing them with a mint ombre sweater. Next, grab a pair of cut-out brogues and a pink woven belt for a cute and casual look. A bold floral tote adds feminine flair, while pretty silver jewelry, like a charm necklace and bird-shaped studs, completes the look with a touch of shine. 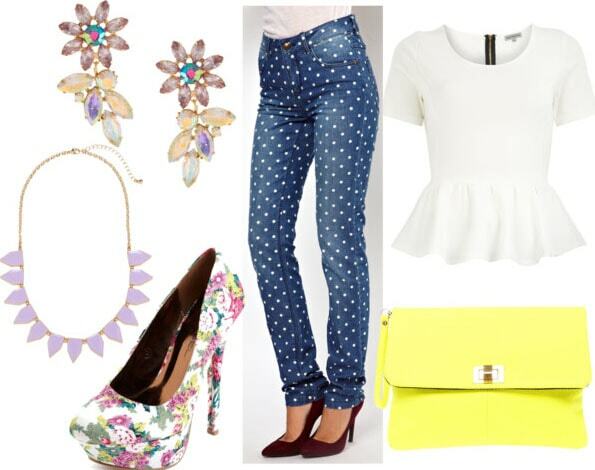 Go bold and eclectic for your night look and pair your jeans with a stark white peplum top. Then add a lilac statement necklace to put a trendy twist on this ultra-feminine look. Show off your adventurous side with a daring yellow clutch and bright floral pumps – the quirky contrast between prints adds fashionable edge. No night out is complete without a touch of bling, so finish off the look with some colorful crystal earrings. Will you be wearing polka dota this spring? How would you style these jeans? Be sure to leave me a comment and let me know what you think of the outfits, I love hearing your thoughts!